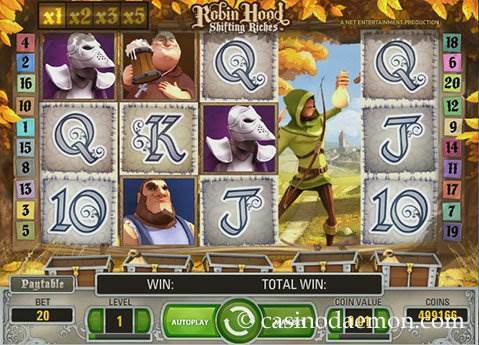 Robin Hood - Shifting Riches from Netent is an interesting slot with, as you may have guessed, Robin Hood in the centre of the story. In this game, the famous thief will share his findings with you. The game has a very nice layout, and the music reminds of fantasy knight movies - it will certainly keep up the suspense. What makes this game special are the game mechanics with shifting reels and the free spins. You can also get win multipliers of up to x5 for consecutive wins! The variance of the slot is medium, and you will probably be able to win most money in the free spins. Due to the nature of how the free spins are triggered, this is not a game that you should play for just a few rounds, it should be played for a while to make the most of it and get the best winning chances. However, the consecutive wins and multipliers can lead to some fantastic wins in the normal game! The theoretical return to player is 96.8%, which is on the higher end for online slots. Unfortunately, Robin Hood - Shifting Riches mobile is not available, and you won't be able to play the game on the go. Here, you can play Robin Hood - Shifting Riches for free and see for yourself what all the fuss is about! If you like the game and would like to try your luck with real money you can play it at one of the online casinos from this page. Each time you get a winning combination the reels will shift to the right and show a new reel of symbols. The multiplier will increase the next highest step x2, x3 and x5. The win multiplier after three consecutive wins will be x5. The shifting continues until there are no further wins. 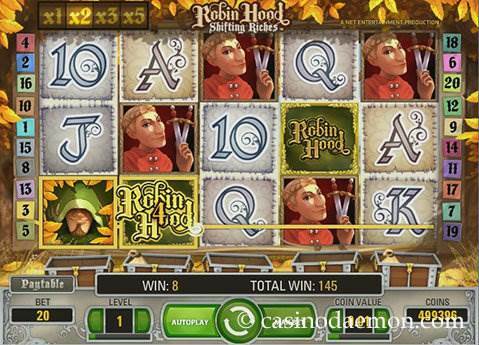 The slot also has a wild symbol with the Robin Hood logo that substitutes for other symbols, but not the moneybags or the free spins symbol. Below the reels are empty chests, and each time you get a money bag on a reel it will fall into the respective chest. You need to collect 4 moneybags in a chest in order to start 10 free spins. If you have more than one chest filled with moneybags you will get additional 10 free spins. The free spins are played with an average coin value of the stake that you played the game with. You can find the exact formula in the game rules, and you can click on a chest to see the coin value for the free spins. Once they appear on the reels, the moneybags also turn into wild symbols. You can also collect additional free spins with the free spins symbol, and two of them give you + 5 free spins, and 3 free spin symbols give you + 10 free spins. One thing to keep in mind is that your progress in the game is saved, and moneybags in the chests are saved up to one year. Also keep in mind, that the casinos will most likely not tolerate that you play through to the free spins with bonus money, and they may void if your winnings. 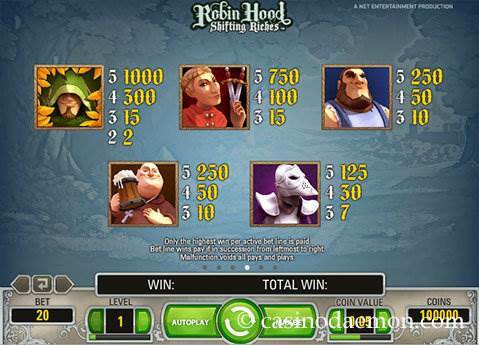 It is a common myth, that you can beat Robin Hood slot by playing it with bonus money until you make it to the free spins, and then switching to real money play. 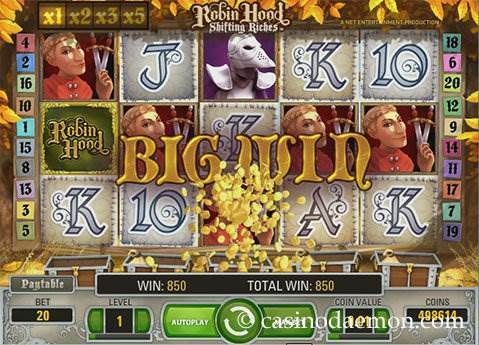 The Robin Hood - Shifting Riches slot has 5 reels with 20 fixed pay-lines. You can select from coin values between 0.01 and 0.50 £/$/€, and you can also select to play up to 10 coins per line. The minimum you have to bet in one round is 0.20 £/$/€, and you can raise your stake up to 100 £/$/€.